Galba. 68-69 AD. 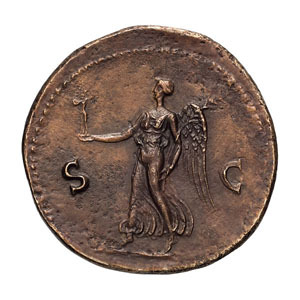 Sestertius, 23.28gg. (6h). Rome. 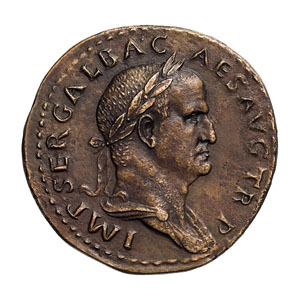 Obv: IMP.SER.GALBA.C - AES AVG TR P Bust laureate, draped right., seen from side. Rx: S - C across field, Victory advancing left holding Palladium and palm.. BM 107. Paris 174 (same obv. die). Cohen 261 (6 Fr.). RIC 352 (S). Extremely sharp and complete, showing even the details of the leaves in Galba's wreath which are usually lost to flat striking or wear. Struck on an exceptionally broad flan and perfectly centered; probably one of the finest Galba sestertii in existence. Magnificent EF. Ex Bertolami 37, 19-20 September 2017, lot 578. Ex NAC 78, 26-27 May 2014, lot 2148. Ex M. Ratto, Milan, 19 January 1956, lot 80. Ex M. Ratto, Milan, 26-29 January 1955, Dr. G. Giorgi Collection, lot 366. Ex M & M Basel VI, 6-7 December 1946, lot 796. Ex R. Ratto, Lugano, 8 February 1928, Morcom - Hands - Wertheim, lot 2213. Ex Naville II, 12-14 June 1922, Vautier - Collignon, lot 394. Kraay 73, Officina B, obverse die A1, reverse die P105, cited only our single coin for this die combination, though Kraay mistakenly made one of its auction appearances into a different, second, specimen; Kraay's specimens a and b are actually one and the same coin. The reverse type is interesting, conveying the idea that it was within Victory's power to bestow control over Rome (the Palladium); such a type occurred only on sestertii of the two successive emperors Nero and Galba, under Nero on a very rare coin of late in his reign showing Victory advancing right (BMC pl. 48.1), then under Galba on scarce sestertii showing her advancing either left or right, found by Kraay in a total of nineteen reverse dies (p. 56).